Dallas Synergy Chiropractic is a fun, lively place that is welcoming for your entire family. Our practice members love knowing they can bring their little ones in with them, let them play and be themselves. Children have their own play area, but in truth, our entire space is a kids’ playground! There are plenty of toys around and other children to play with, including Chet and Tinsley, Dr. Brittney and Dr. Bryan’s son and daughter. You can let the stress of the day disappear from the moment you walk into our family-friendly atmosphere! Are you concerned that your child may not be able to sit through their initial visit? We understand. You can come in alone to their consultation to speak with Dr. Bryan or Dr. Brittney. We can even arrange a phone consultation or do it on video chat—whatever works best for your family! Just let us know if you’d like to choose this option. We reserve about an hour for this appointment. You may not require that much time, but we want it to be available if you do. You can complete the necessary paperwork when you schedule your appointment online so that we can study it before you arrive. You’ll sit down with Dr. Brittney or Dr. Bryan to talk about your history and have your questions answered. Then, we’ll begin the examination process, which includes testing with the CLA INSIGHT™ scanning technology. These scans allow us to go beyond the surface so that we can view and analyze how your body is adapting to stress. They’re noninvasive, safe for all ages and provide a full picture of your health. When your first day is complete, we’ll have you schedule another appointment for your report of findings. 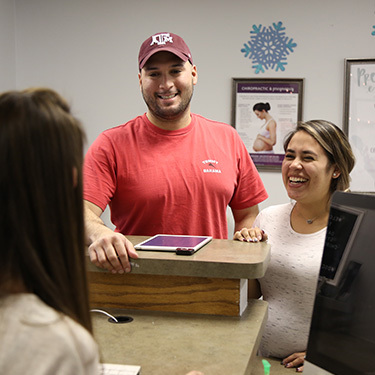 When you return, you’ll sit down with your chiropractor for an in-depth overview of your examination results, including each scan that was taken. We’ll detail what stresses are present and how they’re manifesting in life, as well as our plan to reduce them. You’ll gain an understanding of how many visits are necessary, when you’ll have re-examinations and all costs involved. If you choose to move forward, you’ll have your first chiropractic adjustment. You’ll get in promptly and get on with your day at your regular appointments, taking just 5-7 minutes. Every 12th visit, we’ll take another set of scans to see your progress, which we’ll go over at the next visit. Know that continuing care is entirely up to you. Like eating healthily and exercising routinely, our practice members like to come back regularly because they feel great, function better, don’t have to resort to medications and are happier and healthier. Although we do not accept Medicare patients, nor are we “in network” with insurance providers, we do our best to make care affordable to all of our patients. Are you ready to schedule your first visit? Contact us today! We have late opening hours available.